Paper Pumpkin delivered some super sweet Treat Bags in the January kit! The Adoring Arrows kit & exclusive stamp set set you up for Valentine's Day. But... what if you are not handing out loving bags of sweetness to everyone around you?? Luckily, the stamp set will still work for you! If love is not on the agenda, sweet Thank You's are always in season. 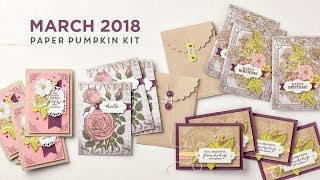 Hands down, if you're going to order anything to compliment those Paper Pumpkin Kits, GET THE NOTE CARDS!! You can order them HERE in white, or if you like the crumb cake brown color shown above, you'll find them HERE. Note cards, they come in a pack of 20 cards and 20 envelopes, pre-scored so folding is a cinch. They will take your kits so much farther! 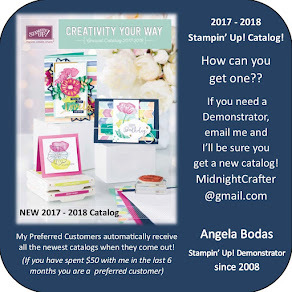 If you up-cycle your kit supplies in to different projects, or if you just want to keep using those darling stamps, note cards will make your life easy! This card uses supplies from the January Kit, glued onto a note card. On a note card, your space is minimized so you can focus on the "less is more" designs. For the Amazing Friend card above, I stamped the sentiment at an angle across the whole white banner from the kit. Topped with the striped vellum banner from the kit, you can still see the design of the words beneath it. I wrapped the banners in the gold thread from the kit, and tucked a small banner in, with the sentiment stamped on it. Gold arrow feathers snipped apart make lovely chevrons! This next card uses a piece of the pattern side of the treat bag for the gold hearts, and - Trash to Treasure - the leftover piece of card stock from the die cut hearts. Used it! Cut carefully, and you'll get maybe 4 cards out of the kit pieces. Full size card, with a Calypso Coral layer, covered by the die-cut scrap. Waste Not, Want Not. Use those gold hearts for smaller punches or panels. Use the edges of the treat bags for small sentiment banners. More loving friendship - this is a note card again. Perfect for thank yous, or for a note to encourage that amazing friend. The heart is a stamped piece of the die-cut frame, carefully trimmed out. the heart die cut from the kit, and stamps from the kit. Extra fletching on the arrow, and a stamped die-cut heart on this note card. To get the Calypso Coral heart under the tip, I used the back side of the solid Love stamp. and I cut the arrow tips in half to make many small hearts. This card uses a panel of the treat bag, wrapped in the gold thread, on a note card base to hold 3 die-cut hearts. I stamped the solid heart using the back side of the Love stamp. What other great alternatives have you thought up? A great way to challenge yourself to think outside the box (tee hee hee), is to use half the kit to make the project as intended, and then use the other half to try something different. The kit supplies are so easy to transform, and once you stretch your creative muscles, you'll start seeing the possibilities. Need more inspiration? Look through my Paper Pumpkin board on Pinterest HERE.